The ED-EnhancedOptions Mod adds various additional options to change the way Rimworld works. Stop Letters from being shown. Allow Plants to Grow 24H a day, also has an option for SunLamps. Prevents Traps from triggering on your Colonists and Friendly Factions. Allows force attack commands to be given to turrets. Hides the Small Power Connection Wires, Still show in Power overlay Mode. Allow Speed4 Without Dev Mode needing to be enabled, can be turned on by pressing ‘4’. Stop Forced Time Slowdown (Combat). Stop Stripping Corps before Cremation. Suppress Rain caused by Fire. Ability to Suppress writing to the Log File. Ability to modify Learn Rate. 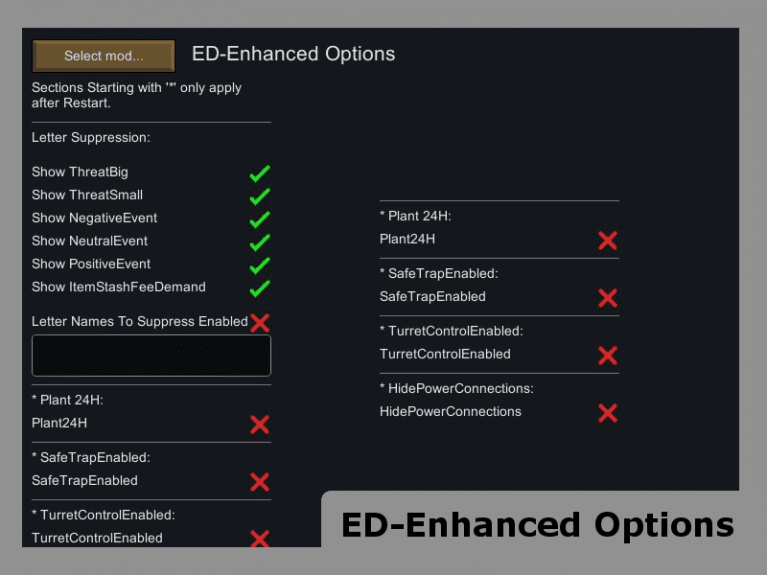 The ED-EnhancedOptions Mod puts together a lot of settings that you can customize to make your game more suited to your needs. If you’re one of those people who like things to work a certain way, you can probably replace 3 or 4 of your settings mods for this one.